A modern addition to any space. The clean lines and subtle curves accentuate any dicor. Suited to a wide variety of applications, corbels will add aesthetic value however you choose to use them. Manufactured from high quality stain-grade wood. Ideal for staining. Not looking forward to cutting those baseboard miter corners? Our pre-mitered crown corner accessories are the perfect choice for a stress free installation. Put an elegant professional touch on your baseboard moulding. Outside Base Corner accessories are used on outside wall corners. Refer to the matching inside Base Corner for inside wall corners. Alexandria Moulding Primed Fibreboard Victorian Plinth Block 1 In. x 3-3/4 In. x 9 In. Plinth Blocks are place at the intersection of a baseboard and casing along a doorway. Plinth Blocks are easy to install and eliminate the need to miter difficult angles. Attention is drawn way from the seams of the moulding and placed on the elegant design of the plinth block. This scroll fits underneath your porch or roof edges to add a decorative accent to the long straight edges. It can be installed side by side along a span or as a centrepiece. PVC construction ensures years of trouble free maintenance. 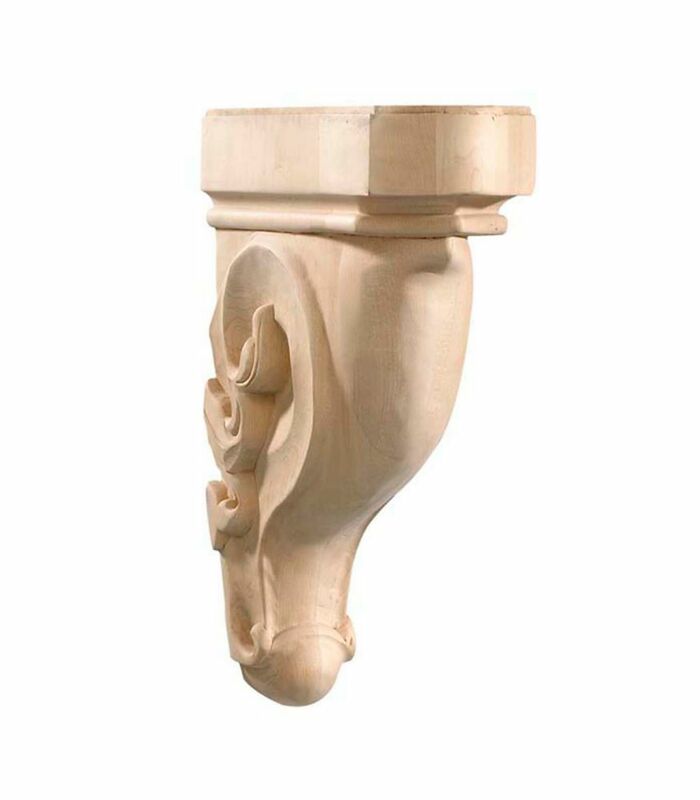 Unfinished Maple Metamorphosis Bar Corbel - 9 Inches x 3-1/2 Inches x 12 Inches A modern addition to any space. The clean lines and subtle curves accentuate any dicor. Suited to a wide variety of applications, corbels will add aesthetic value however you choose to use them.